I haven't been one to wear colored pants and jeans. I have a belly, a round rear, thick thighs, large calves, solid ankles. Black, navy, charcoal, dark denim… these are my safe colors to help my bottom half recede. I'll do white and ivory, but only with heavy fabric and silhouettes that don't cling, and in the past you may have seen me sport a bright pant maybe once before I chickened out and donated them. But when I saw a bright pink pantsuit at Banana Republic I just had to get it! You'll be seeing the blazer in the future, I just need the sleeves shortened a bit. If you follow me on Instagram and check out my InstaStories you know I wore this look to work last Thursday. In fact, these pictures were taken after work so you can see how the pants held up to sitting at a desk, a long commute, and all that jazz. These aren't my first Banana pants; I have them in a black poly twill (seen in this post) and navy pinstripe (seen here and here). These are wool and fully lined; I chose regular instead of petite to have them a traditional pant length and not an ankle pant. I got them when Banana was having on of their 40% off everything deals and had some points (I have a BR card) that made the entire suit less than $140. Not too shabby for a fully lined wool suit. And don't worry if Mary Kay pink isn't your scene, they have plenty of other colors and patterns. 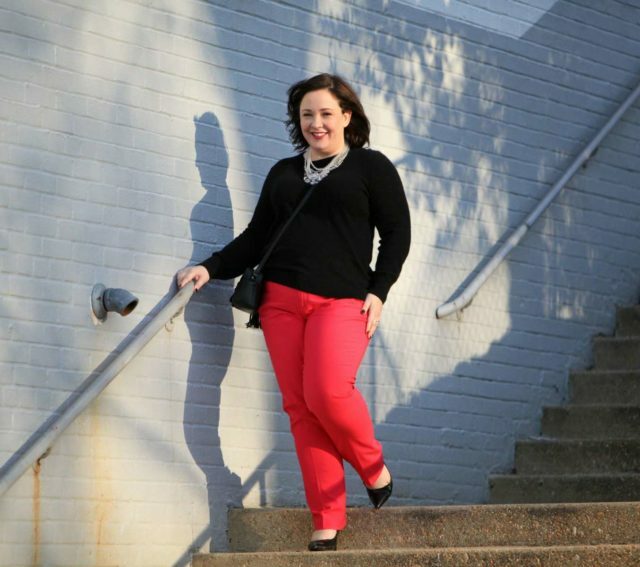 But it's kinda fun to own some bright pink pants, curves and all! 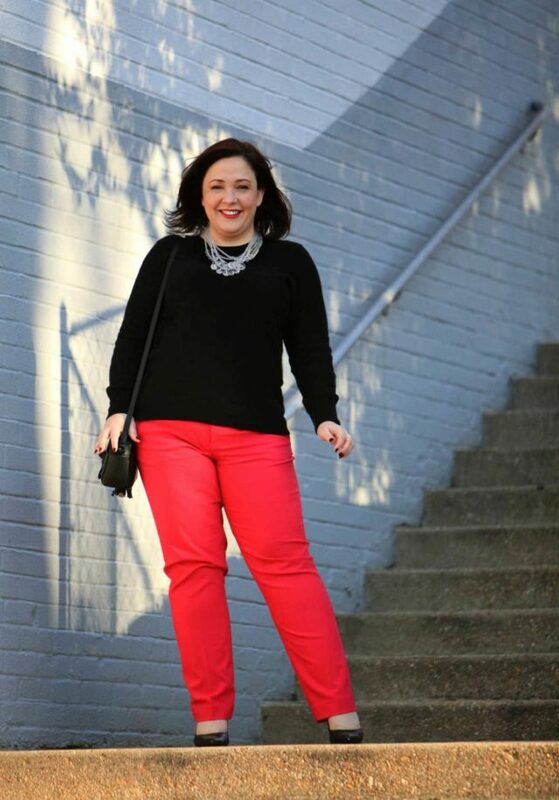 You look great – rock those pants! These look fantastic on you! I was on the fence about buying this colour but after seeing this I pulled the trigger. I love the Ryan for pants from BR, and I think I have about 5 pairs now! Love, love & more love, Allie!! 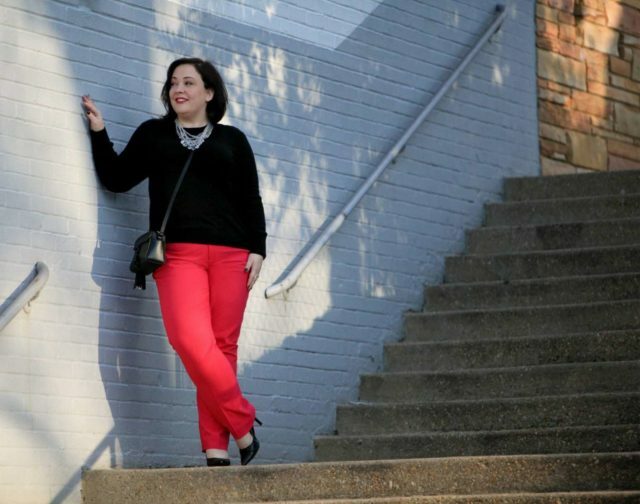 I remember thinking that I was too old to have bright colored pants, but once I tried it, I think it’s kinda addicting!! Those pants are so cute on you! Great fit, fun color. I love this outfit on you! I agree with Morgan below – this outfit definitely seems “you”! 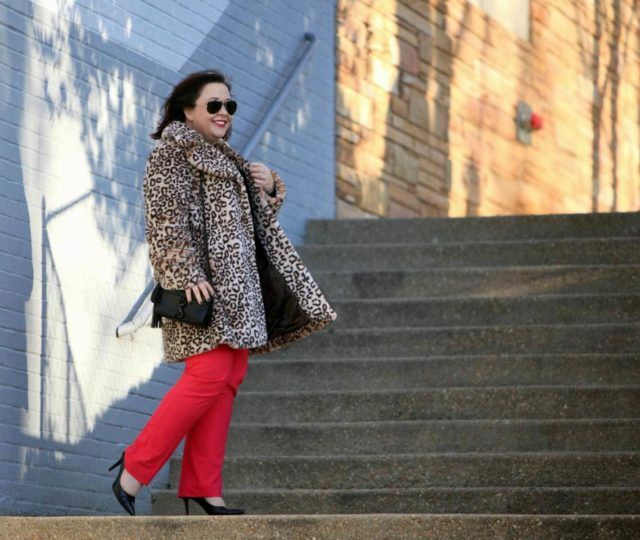 I got hot pink pants this winter, too – mine are the Harper from Old Navy. So they were inexpensive for an item I didn’t think I would wear much. But turns out I love them. I usually wear with black as you’ve shown, but last week I wore with a navy blouse and navy short booties. Definitely plan on wearing into the spring. I just bought these pants today and I thought maybe these would look good with a navy blouse and navy heels (just bought some block heels from Ann Taylor). It’s nice to know there are other colours to wear with them. I find it hard to think outside the box with bright bottoms! These really look great on you! You look great! 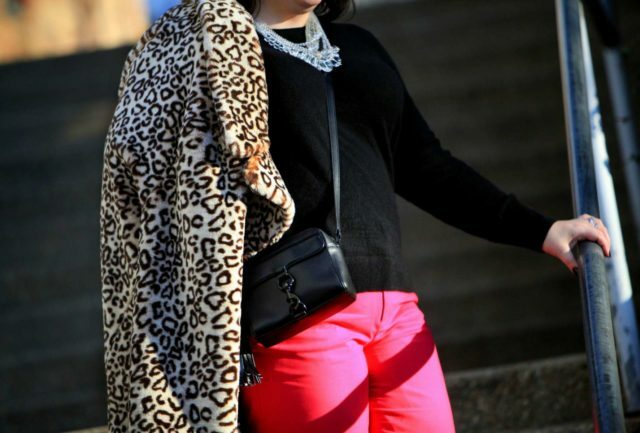 I especially love the pink and leopard combo. You look amazing! When I first saw this this morning I felt like it was “vintage” Allie, and never would have thought about you not traditionally wearing those type of pants. You have a good vibe in this outfit (is that a weird comment? I hope not. :-)).